A few years ago, I did something relatively crazy. I left a steady job – one that had taken me forever and a day to land after a Christmastime layoff during the pit of the financial downturn – to return to school. I thought it would be relatively easy for me – easier than work, right? Hell, no. It was one of the most challenging times in my life. I was roughly twice the age of most of my fellow students, taking the traditional class route. That’s right, none of this night-class, expedited class schedule for me! I had to do it the hard way. I always regretted leaving college. I had an opportunity to fix it and live that experience and I said, HELL YES. I went all in on the experience. I became a staff member of the student newspaper, and took a shift at the college radio station. 2013 was as stressful as any time frame of any job I’ve ever had. I was heading into my senior year, wrapping up some research projects and an independent study. The summer before my senior year began, I started to feel fatigue, then a sharp abdominal pain. I soon learned that I needed minor surgery. It added more urgency and more stress to a time that was already full of plate spinning. In addition to a full class load, I’d taken on the role of news editor and online editor for the student newspaper. Did I mention I was also commuting by train from twenty miles away? Unlike my fellow students, who only needed to stumble out of dorms in pajamas to get to class, I was on the train at 6:30 a.m. many mornings for a full day. And even adding those things together, the most intimidating part wasn’t the learning. That was the joy. It wasn’t the professors. My professors were uniformly interesting, smart people who appreciated my work ethic and my interest, and some of them treated me as a peer. No, it was the fellow students. Because nothing is more intimidating than getting side-eye from a whole bunch of people half your age. And believe me when I tell you that no boss, no angry co-worker has ever intimidated me as much as some of these fellow students. I mean, there was so many of them. And so few of me. I can’t think of this time without thinking about Janelle Monae’s Electric Lady. The lead single, “Q.U.E.E.N,” was released early in the summer, and when the whole album dropped in early September, it was the soundtrack of my life for most of the rest of that senior year. I’m a pretty low-key, mellow person, so I needed to ramp up my attitude and my armor when I went to class. Music will do that for me; I used to get hyped up with PJ Harvey before facing the crowds at the clubs, to get myself in the right mindset. “Q.U.E.E.N.” was my armor song, the compass for my mindset. So many fantastic things in this song, so many texts and subtexts — being an individual vs groupthink, the queer subtexts, the end rap essentially proclaiming Black Lives Matter in its own way and in its own voice before it was ever tagged on Twitter. And the lyrics were on point for my experience: Walk in the room // They throwing shade left to right. A few weeks into the semester, complications from my surgery were keeping me out of school and in the ER. I was heartbroken. So close to graduation, and yet it seemed like my goal of finishing my long-delayed education might just fall back out of reach. It was harder than anything to keep the plates spinning — do the classwork and write the articles and edit the work of other writers, to keep all of that going and yet also address my health issue and get treatment. Victory is a love song, but some of the lyrics hit me in a different way. And so it became my mantra, as I put one foot in front of the other, and slowly got through that semester, and the next one. And so I did. I graduated that May, with a 3.93 average, and over 80 articles for the newspaper during that academic year. 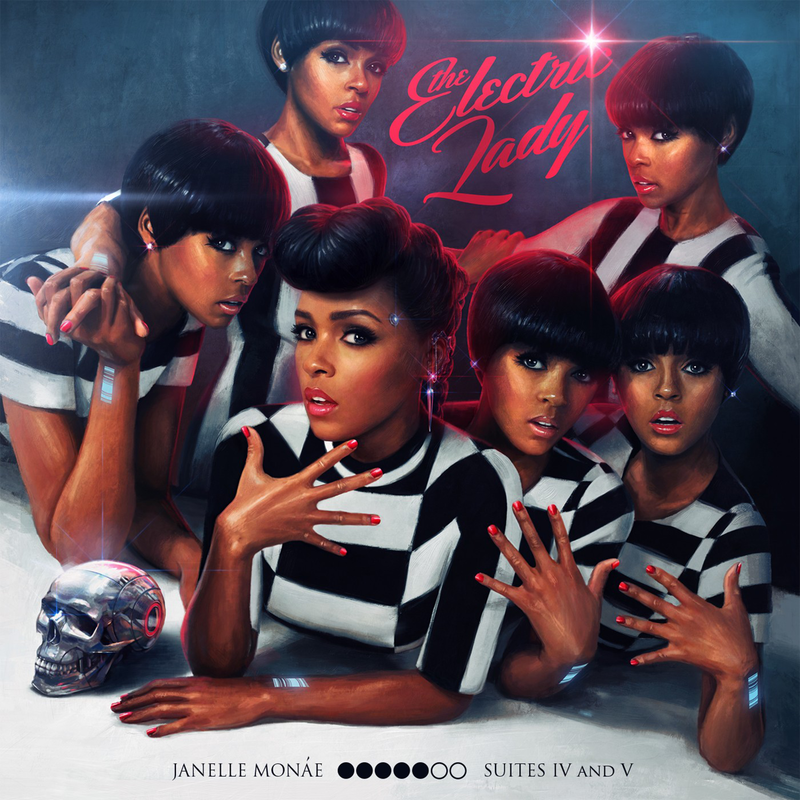 I still spin Electric Lady and Monae’s previous album, The ArchAndroid, almost every day. I’ve said it before and will say it again: it mystifies me why Janelle Monae isn’t at the top of every chart. I have to look back to Prince and Erykah Badu (both of whom appear on Electric Lady) to come up with artists who bring the whole real deal like Monae does. I’m so proud of my accomplishment, though I’ve been spinning my wheels a bit since graduation, trying to get back on the moving train known as my career track. Maybe I need to meditate with the mantra that got me though before. It couldn’t hurt, right?